#1029 Beautiful Window Painting, Sign "Blessings"
Romantic Victorian cottage window sign , painted on a vintage window. 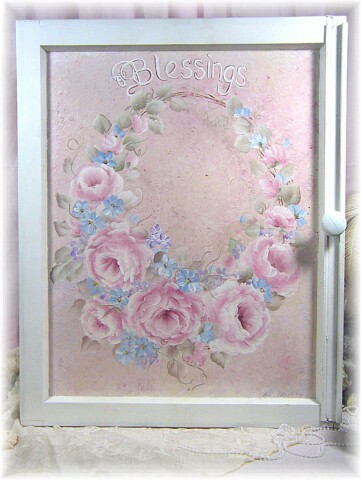 I painted beautiful soft roses and rose buds in shades of pink, with shades of blue and lavender, wildflowers, the writing says, "Blessings" I painted the frame a crisp cottage white, I added a wood knob for even more charm and character, great for hanging your favorite sachet on. It is appx. 19 "x 24""